This Blogspot is based on Scott Hanselmans “WeeklySourceCode”, where MetaWebLog API was the subject of today. 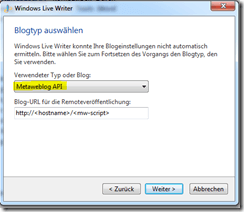 In the Blogspot he relates that MS use the Windows Live Writer also to administrate their own websites. 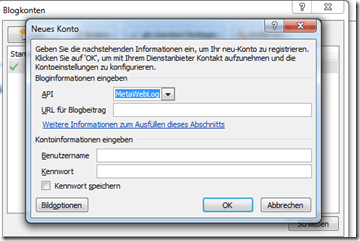 The tool is absolutely practical and it works with MetaWebLog API. With this tool it´s possible to create “CMS” Content with standard tools like for example Word or the Windows Live Writer. The ordinary end user is used to have a basic WYSIWYG editor. There are some nice Editors like for example tinyMCE. But the main problem I recognized while using such web-based solutions, is the often adventurously offered possibilities of handling pictures. The ordinary user likes to move pictures into word by copy and paste and to angle some effects there. If you are a website operator and you would like to give your clients an easy to handle Frontend, than you have to implement MetaWebLog API. The MetaWebLog API has a fixed set of methods. But therefore Keyvan Nayyeri already created a interface for ASP.NET in 2008. I was asking my self what happened to the pictures: they are formed into “NewMediaObject” and it´s possible to convert them as byte array. As I said before, this “HowTo” is based on a Post of Scott. He also released his demo project and I already tried to send files from Windows Live Writer or Word and it works with the described methods.